Naples Twin Lakes Homes: INCREDIBLE LOCATION (less than a mile to beach and in Seagate, Pine Ridge, and Naples High school districts! ), this beautiful, southern-exposure POOL home with almost 2600 sf of total area is made for outdoor living and entertaining! Pretty entrance foyer leading to soaring ceilings, open floor plan, pocket sliders opening to pool in multiple locations; lots of outdoor living area for sunbathing, bar-b-que, basketball, swing set, the list goes on. 3 bedrooms (with area that could easily be made into large 4th bedroom), 2 car garage, and two separate driveways that allow parking for lots of entertaining!! Fenced-in private yard, and HVAC unit only 3 years old. Easy walk to every kind of shopping imaginable and world-famous Fifth Ave. S. dining and shopping just a few minute drive to the south, Waterside just a few minute drive to the north, and I-75 only a 10 minute drive to the east. Naples Twin Lakes Homes: This is a must see property in a great Naples location! Conveniently located between Goodlette Frank Rd. and US-41. Extensively renovated from top to bottom with over $100K in improvements, which includes a new roof, new pool equipment, new stainless steel appliances, new modern tile flooring throughout, newly remodeled kitchen with high-end white quartz, remodeled master and guest baths, new drainage system, newer A/C unit, newer washer and dryer freshly painted, and a new fence. It boasts a large pool, vaulted ceilings, bright sunlit interior, split bedrooms, and a large two car garage. It has in an excellent school district for the highly sought after Sea gate Elementary, Pine Ridge Middle, and Naples High School.1.5 miles to Clam pass beach, and close to many other amenities Naples has to offer. No HOA fees. Move in ready. Priced to Sell! 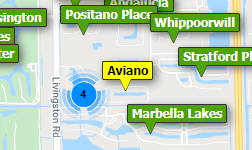 Need professional assistance selling your property at Naples Twin Lakes Naples? Find out how an Area Specialist can help to generate more property exposure in order to get the most money for your investment in the least amount of time.